Very honored to be chosen by Trailblazer Magazine for the feature “I Knew I was a Trailblazer When”. 1.) How long have you been camping and RVing? Who introduced you to it? Tell us how it all began! My wife and I both grew up camping with our families. I did a lot of camping in Northern Minnesota and she camped in Maryland. When we started dating, camping was one of our favorite activities. I remember one stretch we camped 5 out of 6 weekends. Living in Southern California we were able to tent camp year round. We camped so often that we had 2 huge camping bins that we kept in the back of my car so we could be ready to go on a whim to go somewhere cool for the weekend. Earlier this year we packed our stuff into storage, bought an RV and hit the open road as full timers seeking adventure! 2.) How did you first hear about Thousand Trails? We were lucky because Thousand Trails opened up an opportunity for the public to camp at their locations. My wife found Wilderness Lakes online when we were planning a last minute weekend getaway. We had never heard about thousand trails until camping at them and we were hooked. I love scenic hiking and adventure. Danielle loves the amenities like the heated pool, workout equipment, and the community feel. It just made sense for us to join thousand trails because it puts me in epic locations and gives my wife all her amenities to enjoy our stay. To watch the Wilderness Lakes Video click HERE. 3.) What is one of your fondest camping memories? How about one of your fondest TT memories? There are way too many fond camping memories to fit on the page. One time I remember, Danielle and I went camping with friends (new friends at the time) Bill and Leighanna Richards to Big Sur. I’ll never forget the beauty of that coast line. Waking up early to catch the most magnificent sunrise at Pfeiffer Beach. We all bonded so closely over many camping trips over the years that we were in each other’s weddings are still close to this day. Probably our fondest Thousands Trails memory was fishing at Wilderness Lakes. Because it was our first time at a thousand trails resort we didn’t know what to expect. We were pleasantly surprised to be able to fish from our campsite! After dark they had live music and a lot of friendly people. We made quite a few friends that night and we got our first glimpse into the RV lifestyle. 4.) Any funny camping/RVing stories? 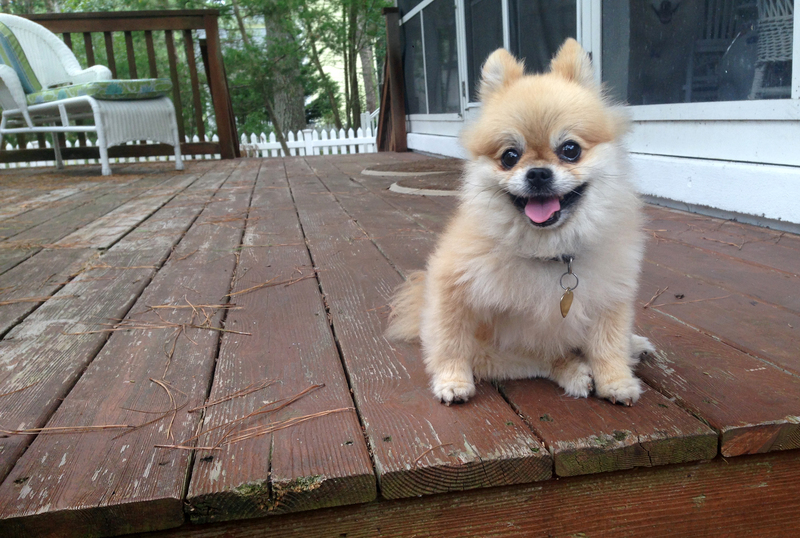 We travel with our dog The Traveling Pomeranian. Danielle found baby gates that work as the perfect Dog Gate! They are lightweight and super easy to set up. Well one day we were at the San Benito location with a great view of the rolling hills. We were eating and doing things on the laptop when Bailey let a little growl. She’s not a barker or growler so I knew something was up and when I looked up there was a skunk right outside our screen door! All of our windows were wide open also. Not a good situation to be in haha. He had walked into the small area we had left open and couldn’t figure out how to get out. So I calmly said to Danielle to walk slowly with Bailey into the bathroom until I come up with a plan. My main concern was Bailey would bark and startle the skunk. Then I remembered the window up top opens up and I could record the skunk from above in the gate. I pulled out my phone, hit record and stuck my arm out the window to record the skunk running around. I figured if I was going to get sprayed anyways, at least I would have good footage. After a little bit he found his way out and happily ran back to the field. You can watch the footage on our blog at www.shorelooksnice.com. 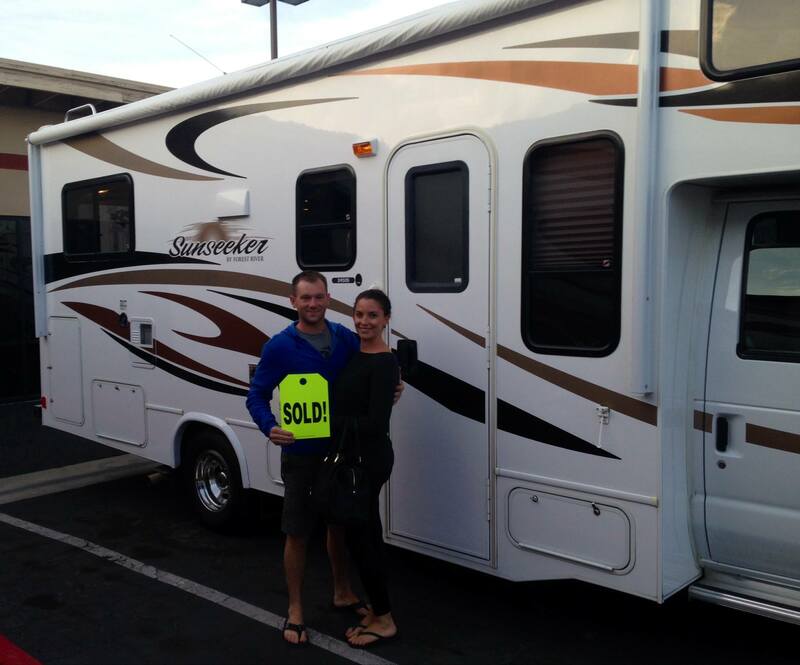 We have a 2012 Forest River Sunseeker Class C RV. We call it the “Suhiclad” which stands for Surf, Hike, Climb, Adventure. I prefer the size of our RV because it’s large enough for Danielle to feel like a home but it’s small enough to fit into cool locations. We also pull our 2012 Mazda 3 behind on a dolly and the power of the RV makes you hardly feel the car behind. We take a lot of day trips with our car when we are RVing. We like to stay for 2 weeks in an area and really explore the surrounding area by hiking, surfing, biking, etc. Recently we were at the Morgan Hill Resort which is surrounded by beautiful wineries in central California. We went to 6 beaches, hiked the Redwoods, toured San Francisco, went to a lake, went surfing, and spent time in Santa Cruz. 6.) Where have you gone that you wouldn’t have otherwise, if it hadn’t been for your Thousand Trails membership? 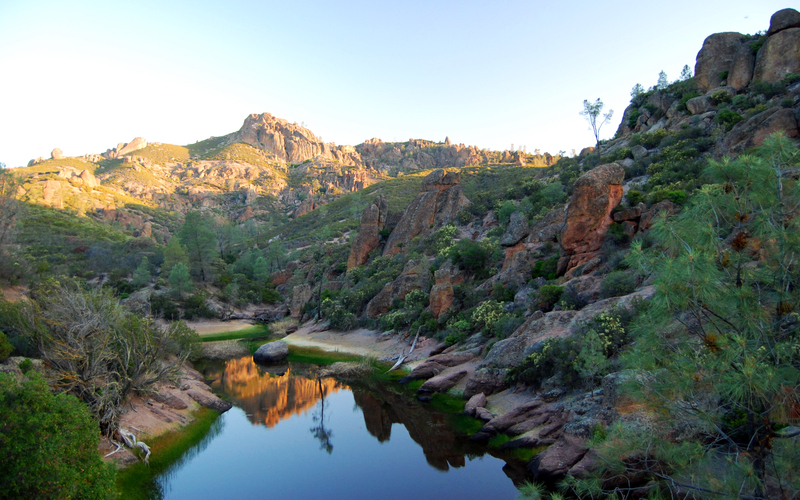 Pinnacles National Park became a national park in 2011. Being so new, I don’t think a lot of people know about it. One morning I went into Pinnacles NP just before sunrise and I was the only car in any of the parking lots. I had the park all to myself. They have a very easy and short hike that anyone can do, it’s a loop trail so it puts you back where you parked and let’s you view a lot of the cool sites. I was stunned at the expanse of these rock formations. The caves had bats coming out of them and heading to the reservoir to eat the bugs off the top. I saw wild turkeys and deer. Then I followed the trail which took me up above to look down over the valley of rocks and forest. I watched the sunrise from a rock sticking way out above the valley floor and had a granola bar. What a breathtaking moment! I would have never found this place if the San Benito thousand trails campground wasn’t just down the street. In fact, I didn’t even know about Pinnacles until I was at the campground and google mapped my location. 7.) What is your favorite part about the outdoor lifestyle? Connecting. Camping is an incredible way to connect with yourself or others. I read a stat a few years ago that camping has been one of the leading activities in happy marriages and families. I know for myself it’s made Danielle and I even closer. But I’ve realized being in a beautiful area it’s easier to connect with God, Nature, Danielle or Myself if I choose to just get away. You can slow things down and enjoy the moment. Year after year I went canoeing as a kid for about a week in the Boundary Waters in Northern Minnesota. In the boundary waters you canoe in and when you get to the end of the lake, you carry your gear and your canoe to the next lake which is usually very close. Then you’re on the next pristine lake with loons swimming within feet from your canoe. I had a massive moose swim within a few feet of my canoe as she crossed the lake with her calf. As kids we would paddle off and go cliff jumping doing tricks into the crystal clear water. But one morning I had my watch alarm set to get up before the sunrise. I was going to go exploring and fishing. I had convinced a few of my friends to come with but when it was time to get out of bed, they wouldn’t come. I was young but I wasn’t going to miss this moment, so I went out in the moonlight collected all my fishing gear I would need to catch “the big one”, grabbed a snack and headed out in a canoe to explore. I canoed around this calm but large lake filled with tree filled islands. At one point I was fishing from my canoe next to a huge cliff with trees all around and while the sun came up I caught a Northern Pike! At that moment time stopped and I knew I’d be an outdoorsman the rest of my life. 9.) Feel free to share any other camping/RVing stories here. We love meeting new friends. 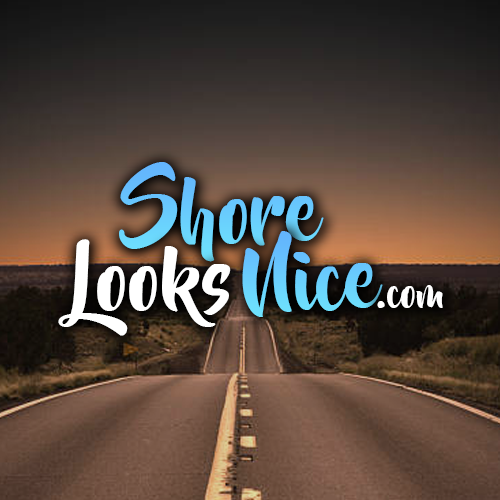 Feel free to follow us on our website at www.shorelooksnice.com and let us know if you’re nearby. Happy Traveling! Thanks and I look forward to featuring you in the magazine! Please feel free to reach out with any questions you may have.